Well hello, my friends! It’s been almost two months since I have updated my blog and I am terribly sorry. Thank you all for sticking with me! I went on vacation, started my senior year of high school, and have been very busy keeping up with life. 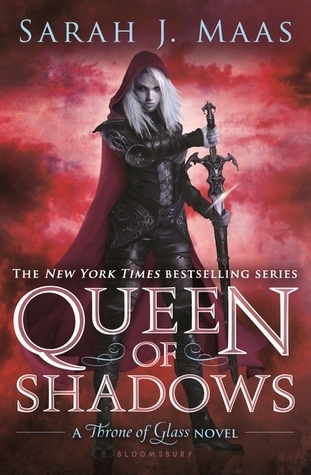 However, a book was recently released that I finished and LOVED and will be reviewing it today… Queen of Shadows by Sarah J. Mass! Queen of Shadows is the highly anticipated fourth installment to the Throne of Glass series by Sarah J. Maas. This novel combines the expected amount of thrilling action and adventure that readers of the Throne of Glass series have come to love as well as introducing an exciting cast of characters to add to the already incredible and diverse group that fans of the series have come to adore. If you follow me on Instagram, you know how much I adore this series. Which is why you’re probably thinking: Why didn’t she give this book five stars?? Don’t get me wrong, I feel as if the book was definitely the most exciting and action-packed of the series, but I also feel that it is heavily lacking in the character development department. Also, this is a side note, but I wanted to leave it out of the spoiler section. I would HIGHLY recommend reading The Assassin’s Blade novellas before reading Queen of Shadows. A lot of the content in this book references and pertains to the novellas and it will definitely enhance your QoS reading experience if you have those stories under your belt. Do not read on if you have not yet read Queen of Shadows. There WILL be spoilers ahead, and I do NOT want to spoil you. Beyond this point is more of a spoilery discussion than a true “review”. Please, please go read this series, and then come back so we can talk about it! Because this book certainly left me with a lot to say.